Anyone else have a problem on this screen? I have played TDs more than 2:1 over any other type. The bar graph on the bottom left has the bottom off the screen. Will update with a pic if this is an unknown issue. I seen this once before with some else,but I thought it was on my end. Seen this dozens of times while checking other user's profiles after combat, especially with folks who make TDs their specialty and/or love to seal club. 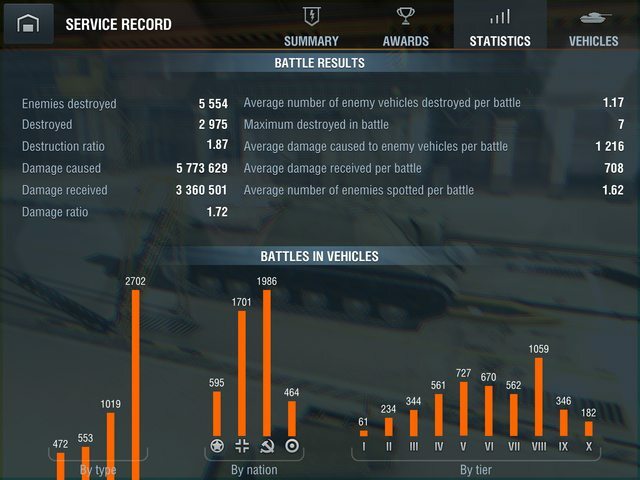 Not saying that's you, but it is pretty common when there's both a large and a small number of battles across two different types of tanks. Most of these folks would have a few hundred in whatever, then thousands in (low tier) TD. Thanks guys. I just wanted to make sure it wasn't anything on my end since I hadn't seen it on anyone else's profile. Good to know it is a known issue.